Hop City is open in ATL! 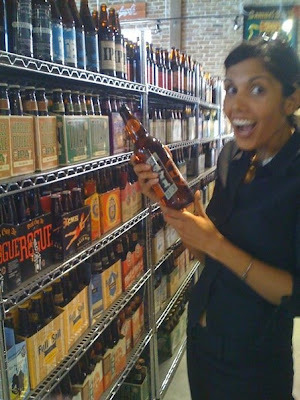 I've never seen such an amazing selection of beer in one place. Truly beautiful. My Breckenridge Double Hopped IPA is in the freezer now because I can't wait for it to chill in the refrigerator! My other choices today were Left Hand Smoke Jumper Smoked Porter and French Broad Wee Heavy-er Scotch Ale. Next on my list of things to try: Lagunitas Maximus IPA, Stone Levitation Ale, and Dogfish Head Black & Blue or Red & White. I'm open to recommendations! I'm done with this month..next please! April was pretty crappy for me. Good thing it's over...I'm now done with graduate school, my knee is better, and my team bikes should be ready to ride very very soon. This all means that 1) I can start making some money and 2) I can resume training, racing, and feeling like a mountain bike racer again. What better way to do it than when the weather is 80* and sunny in Georgia and you have a 10-day trip to Colorado coming up? As for racing, the Dirty Spokes 6/12 hour race is this weekend at Fort Yargo. Originally, I was going to race solo..then I was thinking about joining a team. I emailed my coach to ask her if that would be OK and then promptly realized that she would probably tell me no. And, yeah, she pretty much did. Haha. BUT...I just found out that the US riders of Topeak-Ergon will be attending the Gunnison Growler in CO at the end of May!!! I am going to go out early and stay longer to get in some vacation/ride/brewery time with my teammates and friends...oh yeah!!! One last thing, have you seen this? 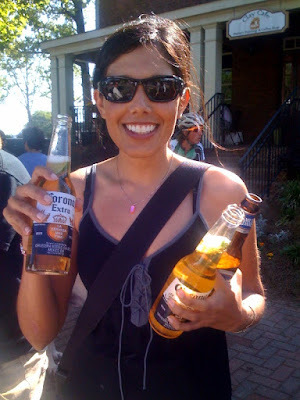 Photo taken by Shelley @ Roswell Crit on Sunday! I need something to obsess over so I reworked my 2009 schedule. It's still pending coach approval, but here it is! Obviously, I'm starting and ending my "season" a lot later this year and that is OK. You will notice I added back 24 hour Nationals because, well..I can't resist not going. At least my Rotwild race bikes should be all together and completely ready to go by the end of May! That's how I roll! I do NOT make a good injured person, I'm too damn impatient. 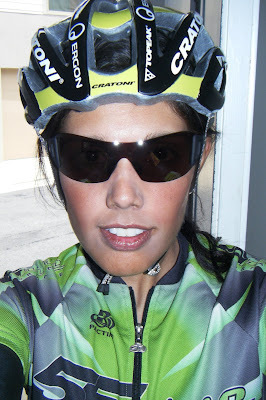 I got a massage @ Georgia Sports Massage yesterday and felt pretty good on my rides this week. SO..what did I do? I went out and rode hard yesterday, I only had an hour so I wanted to make it hurt. (Yeah, the hurt felt so good). But, things around my knee started tightening up again towards the end and this AM. I got reprimanded from Dr. Glass this AM when I went to see him..he told me settle down and to keep taking it "easy". Ugh. 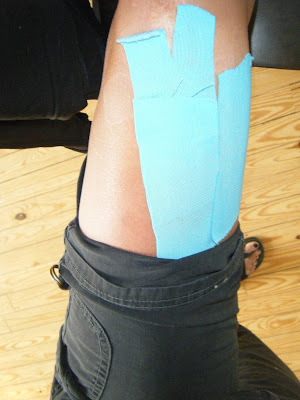 So, I'm trying the kinesiotape out and will try taking it "easy" again. Good thing I'm not doing Cohutta 100 but I REALLY want to be back in for Dirty Spokes @ Yargo and Dirt Sweat & Gears!!! This is the best helmet I've ever owned so I'm going to have to take good care of it. I cannot wait to get on the bike. Everything except the drivetrain and wheels are in for the Rotwild R.R2 hardtail but I'll just borrow that stuff in the meantime. I'll get some more pics soon! Lately, the routine has been: massage, stretch, ice, heat, foam roll, massage stick, biofreeze, repeat. I haven't been injured like this since my running days and I don't miss it at all. I finally realized a couple days ago that attempting to ride everyday (unsuccessfully) was just prolonging the recovery so I decided to completely rest and heal over this weekend. Two weeks and counting to Cohutta 100. It looks like I will have a nice loooong taper, ha! Dirty Spokes Race #2 of the Series (we are about 3 weeks away)! Fort Yargo State Park, Winder, Ga.! Just a quick reminder race registration "late fees" kick in April 22nd. Race course will be run "clockwise" (same as always) and we will be using 95% of the "outer loop" (no horseshoe drop). When you get to the "gas pipeline" you will go up about 1/2 way and turn right down towards the dam - then back up and left into the woods to climb back up to the top of the gas pipeline - cross the gas pipeline - then back to the outer loop (will not do the "new addition" next to the gas pipeline). Should be the same course as we did last year. We have some great sponsors - please check them out: www.dirtyspokes.com and support them as they support us! As always neutral support will be provided by Addictive Cycles / Contes Bike Shop! 6 days of not riding a bike. It's a good thing we don't have any guns in the house. I had one chiropractic and one massage appointment already, and going in for round two of both today and tomorrow. As much as I want to ride my track bike again, I cannot get back on it until it fits me properly...I really need to locate a stem that will work for it. I think what happened is 4 hours of riding on that bike strained my hamstring and then I did that long road ride the day after for the nail in the coffin. Now I have some tendonitis that is taking way too long too go away. Yes, I'm impatient. Cohutta 100 is less than 3 weeks away. I had originally planned on doing the entire NUE, but I may just do a few of them and adjust my focus to some even shorter races this year. The exception, however, is this one! We've had a lot of cold, wind, and even snow the last couple days. I hope I'm able to ride again tomorrow as the temps are supposed to go back up, thank goodness! arrrgh. can't catch a break! My left arm finally healed up, then I crashed on my right arm...NOW my left knee is irritated. 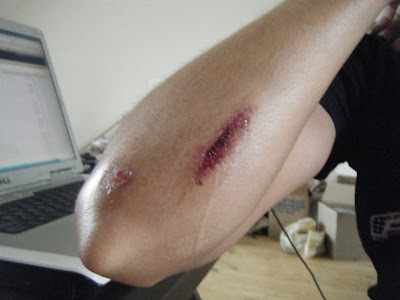 I guess the fixie riding followed by 6.5 hour thrashing was not good for me. I know my left quad muscles are weaker than my right, despite me trying to correct that over the off-season. Everything on my left side fatigues quicker and that's what happened at hour 6 of the ride this past Wednesday. I saw Dr. Josh Glass today and he seems to think I'll bounce back quickly but I need a massage and lots of ice and foam rolling. I'm going to rest it again today in hopes that I can take advantage of 74* and sunny tomorrow...pleeeeeaase!!! SEE-ME 2009 is tomorrow afternoon at the Concourse Athletic Club..should be a good time..stop by the 55nine Performance booth if you're there. I had long sleeves on, and ripped them up. My shorts got it too, leaving me with a nice strawberry on my hip/thigh.